In what’s being seen as a huge step forward in the effort to curb climate-warming emissions, the United States and China have ratified the Paris global climate agreement. Other countries are now expected to follow suit. 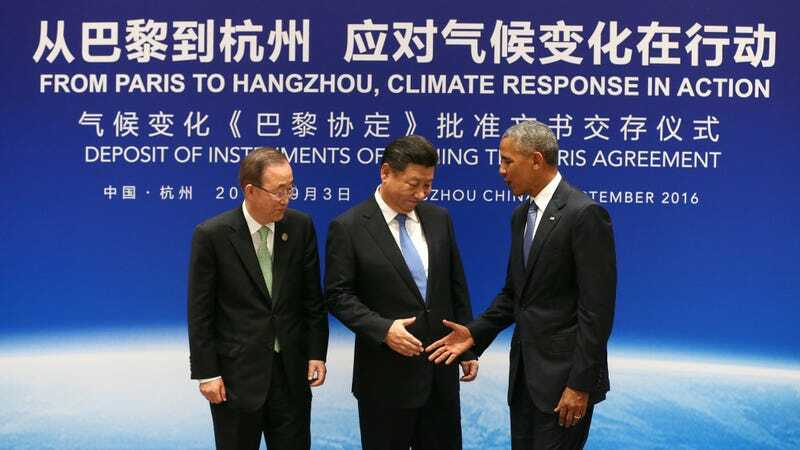 Earlier today, US President Barack Obama and Chinese President Xi Jinping submitted their written commitments to join the Paris agreement at a meeting in Hangzhou, China, that included UN Secretary-General Ban Ki-moon. The joint ratification, which involved the world’s largest two economies, could inspire other countries, such as Canada, India, the UK, and Brazil, to do the same. “The signal of the two large emitters taking this step together and taking it early, far earlier than people had anticipated a year ago, should give confidence to the global communities and to other countries that are working on their climate change plans, that they too can move quickly and will be part of a global effort,” said senior Obama adviser Brian Deese in a meeting with reporters. Both the US and China hope to see the pact put into force by the end of the year. The Paris agreement is a global pact to slash greenhouse gases and limit the rise in temperatures to well “below two” degrees Celsius. It was forged by nearly 200 countries last December, but has yet to go into effect. In order for it to become legally binding, 55 nations representing at least 55 percent of global emissions need to formally ratify the treaty. Prior to today’s announcement, only 23 nations had ratified the agreement, collectively representing a meager 1.08 percent of all global emissions. With the US and China now officially joining in, this figure jumps up quite substantially; China represents about 20 percent of global emissions, while the US accounts for about 18 percent. The joint pact is considered a big victory for President Obama who hopes to see the pact put into place before the US election in November. US Democratic presidential candidate Hillary Clinton is a supporter of the accord, but her rival, Republican nominee Donald Trump has said he’d dump the Paris agreement if elected, saying climate change is an elaborate hoax.